"Prevent Heart Attack With An Anti Inflammatory Diet"
Could You Name Somebody Who Has Heart Disease? I'm quite sure you could. Did you know that most people who have blocked coronary arteries, are treated for it in the same way. Cut Out Fat, And Take Your Statins To Lower Cholesterol. Is This Working For Most People?. The incidence of this disease is not going down, it's actually getting worse. But why? Read This Quote From "The Great Cholesterol Lie" , By Renowned Heart Surgeon, Dr.Dwight Lundell! "I'd be in the midst of surgery, looking down at a patient, thinking, this man should not by lying on my table. He doesn't have the typical risk factors. His cholesterol is in check, he doesn't drink or smoke, he is not obese and he doesn't have a beer belly . Yet, he had the same condition I saw in each and every surgical patient - inflammation." What most people do not realize is that the conventional medical wisdom that once viewed cardiovascular disease as a plumbing problem now sees it as an Chronic Inflammatory Disorder . What we know as the bad cholesterol, LDL , provides the raw material for the deposits of plaque. Doctors once believed that anyone who had a high level of LDL cholesterol had a greater risk of blocked coronary arteries. The problem with that belief was that about half the people who had acute myocardial infarction did not have an elevated level of LDL cholesterol. I know that to be true in the case of both my mother in-law and my father in-law. They both had low cholesterol. Great, no problem. Wrong! They both ended up having by-pass surgery. Inflammation Was Never Mentioned. We now know that chronic inflammation helps trigger heart attack or stroke by making plaque less stable and therefore more likely to rupture and generate artery-blocking clots, and hardening arteries. Do You Know How To Prevent Blocked Coronary Arteries? don't get a beer belly . Dr. Eric Topol, Department Chairman, Cleveland Clinic Heart Center states: The new information about inflammation will, "change everything we do in coronary artery disease." He adds that in the past, people talked about their cholesterol levels. In the next decade everyone will need to know their c reactive protein level. You check c reactive protein with a simple blood test at your next clinic visit. Be sure to take a pharmaceutical grade Omega 3 Fish Oil Supplement to reduce your chronic inflammation. Another serious warning about your heart: When you check your blood pressure or have it checked, pay close attention to your heart rate. Especially if you are experiencing any weakness, are light headed, or dizzy. 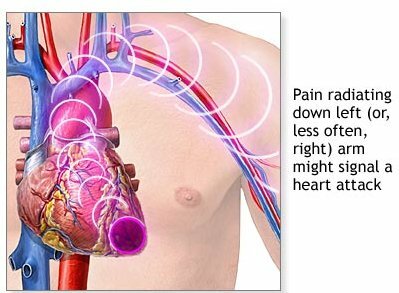 This could mean your heart rate is too low and it could be fatal if not corrected. My husband just experienced this very thing. He felt weak, tired, short of breath and light headed. When he checked his blood pressure it was fine but his heart rate was 40. This is not good. He drove himself to an emergency room and after a lot of testing he had a pacemaker implanted. His heart rate will never go below 60 now. He feels like a new person. He is able to go for a walk and not get winded. His legs don't hurt anymore and he has so much more energy. Its just amazing the difference. So, just another thing to be aware of. Prevent Stroke With Chocolate and Fish!